I had been waiting for this month for nearly a year! My first visit to Japan. I took a short contract to perform on the Sun Princess. For the passengers this was to be a 42 day cruise, for me just 5 days on the ship between Busan in South Korea and Yokohama Japan. A very long flight up to Busan via Hong Kong but an early arrival allowed me to have nearly a whole day to explore the city before joining the ship. The famous Jagalchi Fish Market was insane and I spent a couple of hours wandering around watching and smelling. I would have eaten too, but the hotel Princess had provided for us, The Commodore, had a sensational buffet and I had stuffed myself there first. Yep, every seafood known to man was being consumed, most of it raw, some still wriggling. The ship took me to Nagasaki the next day and after exploring the city and of course the Peace park, Atomic Museum and ground zero site, I headed to Glover Garden. Being a huge Puccini fan, I wanted to see the very place where the opera Madama Butterfly was set. A fantastic spot on the hill above the beautiful harbour, that reminded me of my home town of Wellington New Zealand. 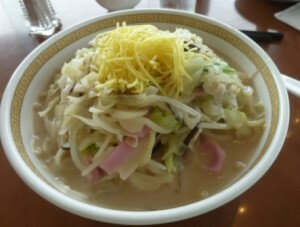 My final adventure was to find the celebrated local dish Champon, a mix of pork, seafood, noodles and vegetables. It was fantastic and I can’t wait till someone decides to take me back to Nagasaki! The rest of the cruise was just work, but those two days made the two long flights well worthwhile.